The Love & Lemons Cookbook: An Apple-to-Zucchini Celebration of Impromptu Cooking by Jeanine Donofrio (Avery) is a delightful cookbook that celebrates fruits and vegetables, because sometimes all you need is a little spark of inspiration to break free from your cooking rut. The photography, by Janine's husband Jack Mathews, is bright and colorful. The book is unusual in that the recipes are organized by ingredient, and there are entire chapters on avocados, artichokes, and stone fruits. The recipes are simple, truly celebrating the bounty of the season and easy enough to prepare on any busy weekday night. As the temperatures become cooler and the air turns crisper, I can't wait to try the "Roasted Cauliflower & Red Pepper Soup," "Spring Leek Soup with Purple Sage," and "Cardamom Apple Crisp." 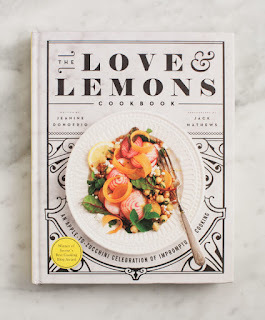 This is definitely a cookbook that I can easily and enjoyably cook my way through; I'll just have to stock up on lemons first.